Tomorrow, 22 September, is #DearDiaryDay. Do you keep a daily diary? Have you ever tried? Apparently, it can be great for your mental health! Studies have shown that expressing our thoughts in a written form on a daily basis reduces anxiety and stress. The Special Collections holds a variety of diaries and journals, some providing exhilarating accounts by Arctic explorers and of expeditions to the Nile. However, a more everyday – but incredibly charming – record comes from Samuel Morris Rich. We have in our strongroom an impressive 45 of his diaries dating from 1904 until his death in 1945: we like to think of him as our own twentieth-century Samuel Peyps (without the scandalous bits!). Samuel was born in 1877 and for 40 years worked as a teacher at the Jews’ Free School in London; he was also heavily involved in the South London Liberal Jewish Synagogue. He was married to Amy (nee Samuel) and they had two children, Connie and Sidney. This portrait of Amy taken in the summer of 1898 makes a fitting frontispiece to the whole series of diaries. The dress & hat she wore on the first occasion I “took her out” – to the Crystal Palace – we met at Kennington Gate. I started a journal on Nov 26th of this year which I hope to continue until that day on which I join the great majority. The practice is useful for many reasons chief among which is the check it puts upon the method of spending one’s days. On the last day of every month I will make a list of all books, essays or pamphlets read during the month: this will serve as an excellent check on my reading and I will be able to examine whether I have neglected to ready any good book whatever during the month. A glance through various volumes indicates that Samuel didn’t stick to this initial intention; despite this lapse, it is hard to be critical of such a diligent diarist. Samuel’s diaries provide a fascinating record of everyday life in the first half of the nineteenth century. The timespan covers several world changing events including two world wars. 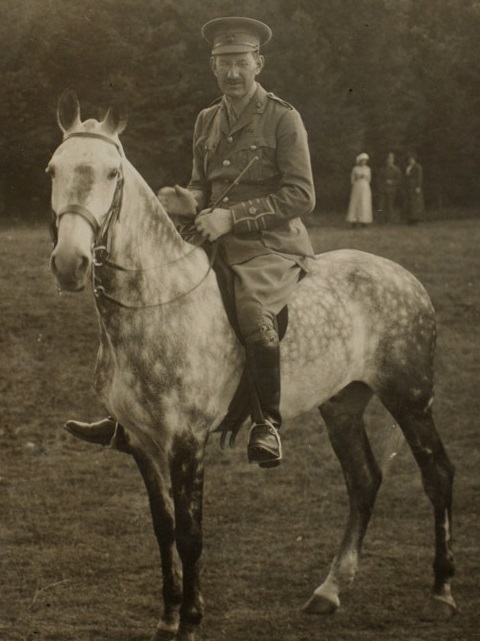 On 28 July 1914 – the official date for the outbreak of the First World War – he records that he and his wife caught the 160 bus to Reigate and had “a good steak”. He does, however, include a newspaper clipping which records that war had been declared by Austria-Hungary: he includes several of these during this period. The end of the War, 100 years ago in November this year, is recorded with great relief and celebration. It is interesting to consider who Samuel was writing for; was it solely for his own benefit? Perhaps he wished to leave a record of his life for his children and grandchildren? His diaries are now packaged in acid-free boxes and stored in our climate-controlled strongroon: what would he made of that?! Could he ever have imagined that his diaries would one day be preserved indefinately as a public record? 6 September is Read a Book day. The image of women as readers became common in the late eighteenth and nineteenth centuries as literacy rates improved and women began to take part in the literary market. With this, however, came the idea of the danger of reading both in terms of appropriate reading matter and reading as an activity. What was permissible for women to read was a matter of intense debate. Indeed, anything might be considered inappropriate since all books could be read subversively. Why books might be inappropriate was based on a range of arguments: that they might corrupt women’s minds and diminish them as women or that women might be unable to cope with emotionally provocative material. The case was also made that reading distracted women from their domestic duties as they learned about the world outside the home: a good and ideal woman should resist the pleasures of reading and take care of her husband and home. Philosophy and metaphysics were subjects that women were most actively told to avoid, although it was the novel, which was written and read by women in increasing numbers in the late eighteenth and nineteenth century, that caused the most cultural anxiety. As soon as novels came to represent a significant share of the literary market, they became the subject of opposition. One accusation was that they created expectations which could not be fulfilled in life. How women read books also became a matter of concern. Silent reading was considered dangerous and solitary reading self-indulgent and potentially rebellious. Reading aloud to others was encouraged as a defence against the “seductive” dangers of sentimental novels. Mary Mee was the second wife of the second Viscount Palmerston and mother of the future British Prime Minister, Henry John Temple, third Viscount Palmerston. Described as a lively and charming women and elegant society hostess, she shared with her husband an interest in literary enquiry. 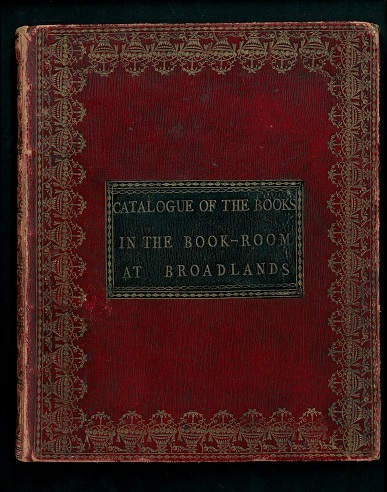 The catalogue of books in the Book-room at Broadlands during Lady Palmerston’s time shows the range of material available for her to read, included were not just the works from the Classics, but relating to history and travel, poetry, literature and a range of novels, together with many works in French arrayed along the South End. What Lady Palmerston read, which included of history, travel writing and poetry — types of works considered acceptable reading for women — can be seen from her own poetry (“To a lady with Plutach’s works” being one example) and by references in her correspondence. 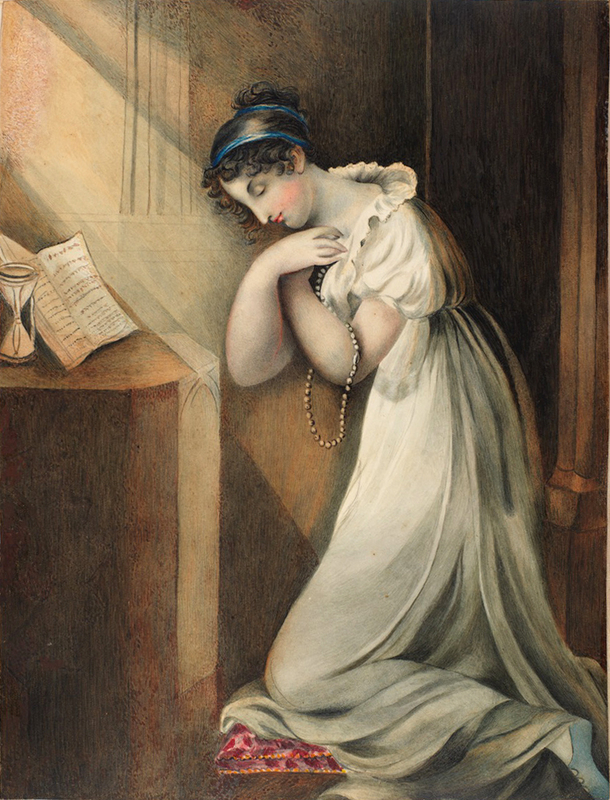 Aside from Richardson, the success of whose novel Pamela might be said to mark the start in the growth of novels within the literary market, Broadlands held novels by a number of women authors, including Charlotte Lennox’s The Female Quixote (1752), Frances Sheridan’s Memoirs of Miss Sidney Bidulph (1761), Frances Burney’s Evelina (1778) and Cecilia (1782), Charlotte Turner Smith’s Emmeline (1788), Ethelinde (1789) and Montalbert (1795) and Ann Radcliffe’s The Mysteries of Udolpho (1796). In Frances Burney was a writer who could produce the comic and satirical energies of Smollett or Henry Fielding. Charlotte Turner Smith has been credited with influencing Jane Austen and particularly Charles Dickens. 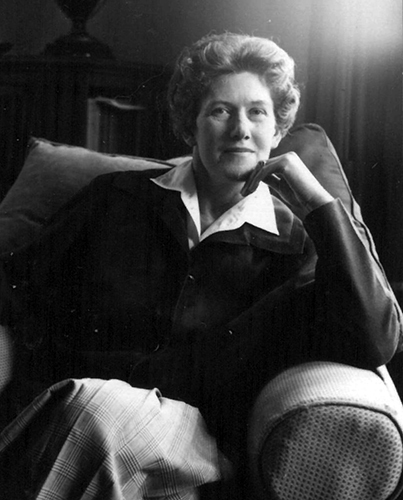 Sheridan’s novel was one of the most popular of the period and focused on the story of a female rake. Yet while it challenged female characterisation and explored the possibility of free choice, the heroine was ultimately to have her freedom quashed. And on this Read a Book day we hope that you will be similarly inspired to renew the acquaintance with a book that you have enjoyed reading. This month we are celebrating all things Irish, and this week we are focusing on Irish literature in the Special Collections with the spotlight on William Butler Yeats’ works in our Rare Books collection. Son of John Butler Yeats and Susan Mary, née Pollexfen, William Butler Yeats was born in Sandymount, County Dublin, on 13 June 1865. The Yeats family consisted of clergymen and lawyers and married into links across Irish Protestants. While William’s mother came from a wealthy family involved in the milling and shipping industry, William’s father had studied law but abandoned it to study at Heatherley’s Art School in London. Soon after his birth, William and his family moved to the Pollexfen home at Merville, Sligo to stay with extended family. William always thought of Merville as his childhood home and it was the subject of many poems. Yeats was raised to support the Protestant Ascendancy, at a time when it was experiencing a power-shift. Major land reform was being demanded by the Land League, and Parliament passed laws that enabled most tenant farmers to purchase their lands and lowered the rents of others. This later led to the growth of the Home Rule movement with Charles Stewart Parnell (Leader of the Irish Parliamentary Party), and the Catholics becoming more prominent. These events undoubtedly had a weighty effect on Yeats and his poetry, and his reflections on Irish character. Returning to London in 1887 with the rest of his family, Yeats helped to form societies like the Irish Literary Society of London, preaching to his circle the importance of writing poems on your familiar surroundings rather than on landscapes you dream of. Yeats’ poems also had a focus on mythology and occultism, an interest that grew from his time at Erasmus Smith High School in Dublin. This can be seen in The Celtic Twilight, originally published in 1902. The poems in The Celtic Twilight explore the strange and elfin realm of fairies, ghosts, and spirits. Yeats starts the book by explaining how he has “desired, like every artist, to create a little world out of the beautiful, pleasant, and significant things of this marred and clumsy world, and to show in a vision something of the face of Ireland to any of my own people who would look where I bid them” (Page I, Rare Books PR 5904). The title refers to the hours before dawn, when Druids, members of the high-ranking professional class in ancient Celtic cultures, conducted their rituals. Referring to the dreamy and mysterious atmosphere that is often associated with Irish identity and prose, the volume is based on a diary that Yeats kept while rambling through the west country of Ireland. Here is a quote from ‘A Visionary’, the fourth text in The Celtic Twilight. Yeats published Reveries over Childhood and Youth in 1916. In this work he writes about his memories of living in London and Ireland, and moments shared with family members. Published during a time when Ireland was fighting an economic war with Britain, and experiencing its first elected president as head of state; Yeats poured his disappointments with Irish society into his work On the Boiler, which includes chapter titles such as ‘Tomorrow’s Revolution’ and ‘Ireland after the Revolution’. 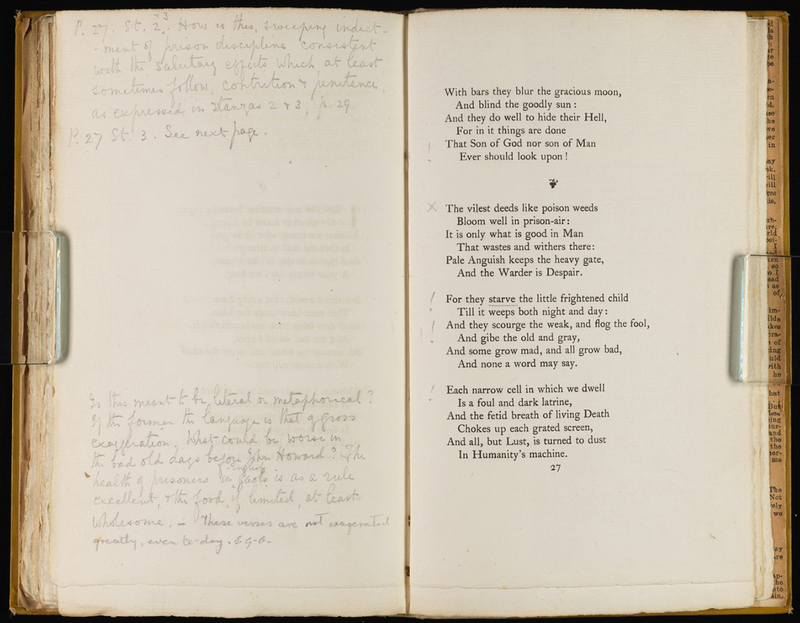 Yeats was dissatisfied with the first printed edition, produced in 1938, and all but four copies were destroyed. Following Yeats’ death, in autumn 1939, a second edition was issued by the Cuala Press. 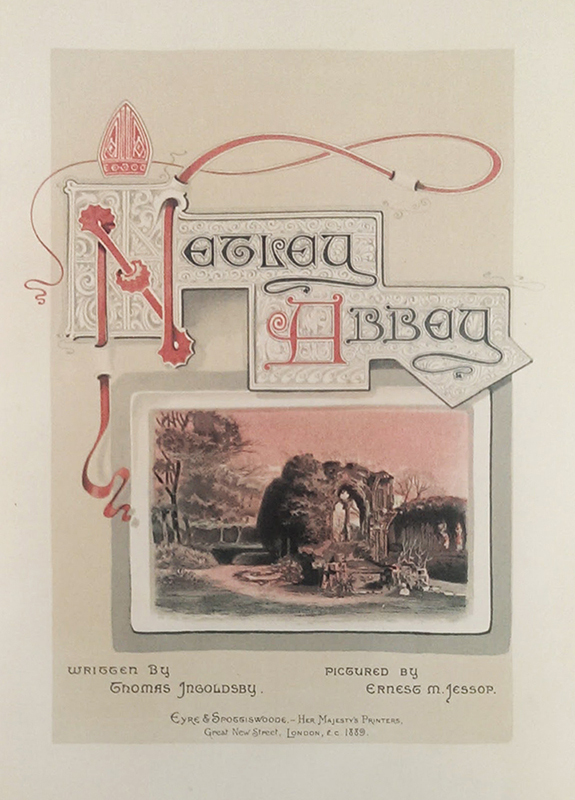 The front cover was designed by Yeats’ brother, Jack B. Yeats. Today marks the 350th birthday of Jonathan Swift (1667–1745), the Anglo-Irish satirist, essayist, pamphleteer, poet, and cleric, best remembered as the author of Gulliver’s Travels (1726). Swift was born in Dublin on 30 November 1667 and was the second child of Jonathan Swift (1640–1667), a steward of the King’s Inns, Dublin, and his wife, Abigail Erick (1640–1710). His father died two months before he was born. Unable to support her son, his mother placed him in the care of his uncle, Godwin Swift. He was enrolled at Kilkenny College in 1674, and in 1682 entered Trinity College Dublin. Having received his bachelor’s degree in 1686, Swift continued at Trinity College to study for a master’s. However, Roman Catholic unrest in Ireland following the Glorious Revolution in 1688 forced him to quit his studies and leave for England. In England his mother found him a position as secretary to the English statesman and essayist Sir William Temple (1628-1699) at Moor Park in Surrey. During the subsequent decade, Swift assisted Temple in political errands and research for his essays and memoirs. Under Temple’s guidance, and with a rich library at his disposal, it was at Moor Park that Swift developed his skills as a writer. 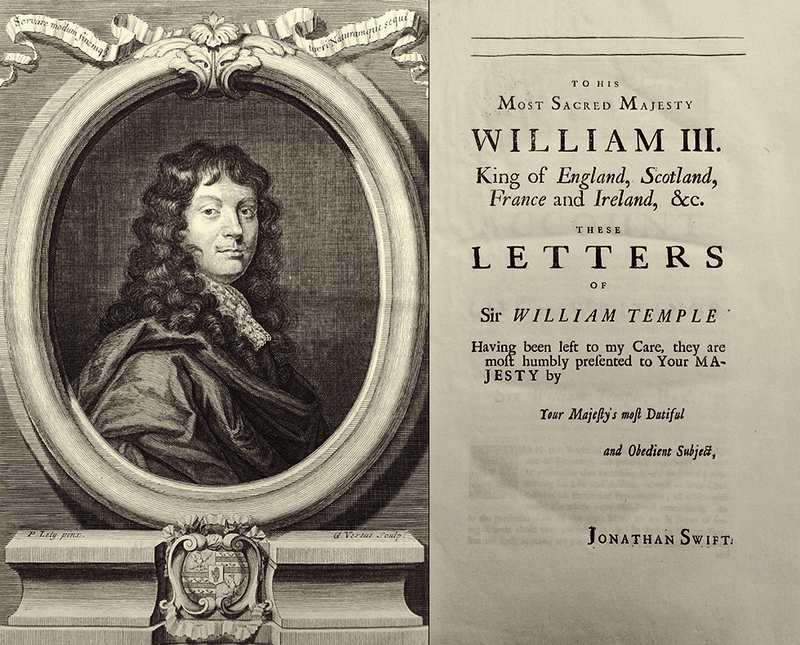 During this time he wrote a number of essays, including A Tale of a Tub and ‘The Battle of the Books’, published together in 1704 and both touching on the debate surrounding Temple’s essays on ancient and modern learning. It was also during this time that Swift met Esther Johnson, known by her nickname “Stella”, whose mother was in the service of William Temple. Swift took a keen interest in Stella and acted as her tutor and mentor. The two would maintain a close relationship throughout their lives and a debate continues as to whether they were secretly married in 1716. Swift returned to Ireland twice during the decade he worked for Temple. During one of these visits, in 1695, he took the necessary steps to become an ordained priest in the Church of Ireland. After Temple’s death in 1699, Swift completed the task of editing and publishing his memoirs. This, however, resulted in a clash with members of the Temple family, most notably Lady Gifford (Temple’s sister), who argued against Swift’s inclusion of material against Temple’s wishes. Sir William Temple had two sisters, Martha (later Lady Gifford) and Mary, and a brother, John. Sir John Temple (1632-1705) was an Irish lawyer and politician and father of Henry Temple, first Viscount Palmerston (1673-1757), who purchased the Broadlands estate in 1736. It is through this link that the Broadlands archives contain a number of items relating to Swift. Among Swift’s poetic broadsides on the subject was ‘Prometheus’, originally published around November 1724. It was retitled ‘Prometheus. On Wood the Patentee’s Irish Half-Pence’ in later collections. 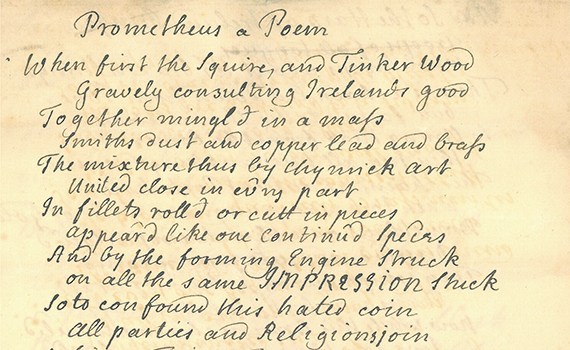 A manuscript copy of the poem, dating from 1724, can be found in the Broadlands collection [MS 62 BR3/36]. Another group of items relating to Swift are three letters exchanged between Swift and first Viscount Palmerston from January 1725/6 [MS 62 BR3/63-5]. The two men had known each other since Swift’s time at Moor Park. As with other members of the Temple family, their relationship was strained. Three months earlier, in the fourth of his Drapier’s letters (titled To the Whole People of Ireland), Swift had named Palmerston among the Englishmen who held substantial sinecures paid for out of the Irish treasury. The short exchange, which can be found among Swift’s published letters, centres on the letting of rooms at Trinity College Dublin to a William Curtis who Swift claims “has been very unjustly and injuriously treated” [MS 62 BR3/63]. Swift is of the understanding that Palmerston had granted the rooms to a John Elwood for life and, as such, Elwood had the right to sublet them to Mr Curtis. In his response, Palmerston informs Swift that the rooms had been granted to Elwood for his personal use, and not for subletting, and that “When he quits, I am att liberty to dispose of the premises again” [MS 62 BR3/64]. In the final letter, Swift acquits Palmerston “of any injury or injustice done to Mr. Curtis”, noting that the “injury and injustice he received were from those who claimed a title to his chambers, took away his key, reviled and threatened to beat him, with a great deal more of the like brutal conduct” [MS 62 BR3/65]. While the matter is ultimately cleared up, the tension in the exchange is palpable. Swift, in his first letter, states that he will refrain from commenting on William Curtis’ character, referencing a Thomas Stauton who he had once recommended to Palmerston but “whom you afterward rejected, expressing your reason for doing so, that I had recommended him.” Concerning the rejection he concedes, with more than a hint of sarcasm, that “these are some of the refinements among you great men, which are above my low understanding” [MS 62 BR3/63]. Palmerston adopts an equally sarcastic tone in the opening of his reply, stating that “I should not give my selfe the trouble to answer your polite letter, were I as unconcerned about character & reputation as some are.” He then proceeds to clarify the conditions under which the rooms had been granted to Mr Eldwood and defend himself concerning his dismissal of Mr Stauton, which was due to “his demand of a large additional salary, more than he had before my time”, noting that “he left the office, and was not turned out” [MS 62 BR3/64]. 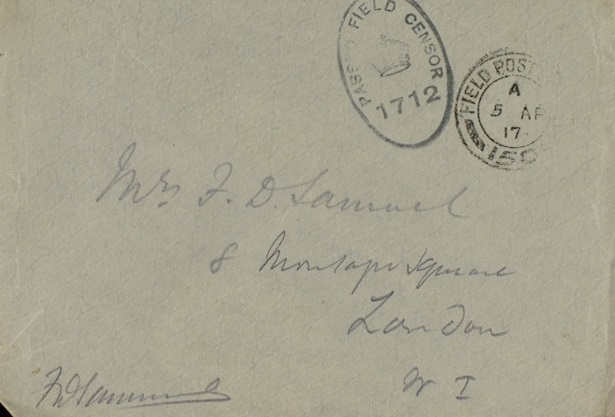 Swift opens the final letter with the line “I desire you will give yourself the last trouble I shall ever put you to; I mean of reading this letter.” Then, in addition to acquitting Palmerston, he acknowledges his indebtedness to the Temple family, and defends himself against any misunderstanding, stating: “My lord, if my letter were polite, it was against my intentions, and I desire your pardon for it” [MS 62 BR3/64]. Palmerston has endorsed the letter as “Not answered”. The matter of the rooms at Trinity College was later taken up by third Viscount Palmerston in a letter written in 1813 to his agent, Graves Swan, in which he requests Swan to pursue his claim to the rooms [MS 62 BR146/10/1]. Jonathan Swift held the position of dean of St. Patrick’s Cathedral in Dublin until his death on 19 October 1745, at the age of 77. Lying on the eastern bank of Southampton Water, Netley Abbey is one of the best surviving Cistercian abbeys in England. The abbey was founded in 1238 by Peter des Roches, the Bishop of Winchester, shortly before his death. The following year a colony of monks arrived from nearby Beaulieu Abbey (founded by King John in 1203). Netley was dedicated in 1246 and, following its completion, was home to about 15 monks and 30 lay brothers, officials, and servants. Henry III became a patron in 1251, bringing great wealth to the abbey. The dissolution of the monasteries under Henry VIII brought monastic life at Netley to an end. Following its seizure in 1536 the buildings were granted to Sir William Paulet, a loyal Tudor politician, who converted them into a mansion. The abbey was used as a country house until the early 18th century, after which it was abandoned. At this time much of the brickwork added by Paulet was removed to be used for building materials. The site then fell into neglect, becoming overgrown with trees and ivy. In time, the site came to be celebrated as a romantic ruin, eventually becoming a tourist attraction and providing inspiration to writers and artists of the Romantic Movement, including John Constable, Thomas Gray, and Horace Walpole. The latter wrote that “they are not the ruins of Netley, but of Paradise”. It is also believed that Jane Austen drew inspiration from the abbey for her Gothic parody Northanger Abbey. On Monday we set off from Southampton at ten in an open boat as there was not wind enough to allow of our making use of the cutter. Our party, the Hatsells, Sloane, Stephen, Maria, Captain Southerby, Mr Ballaird and a Mr and Mrs Barton great friends of the D’Oyleys, and in truth in that consists all their merit, for I have not often seen more disagreeable people. We had a most delightful row to Governor Hornby. I think you have been there and I dare say admire the situation which is in my opinion in point of view superior to anything in this country. We went on board the yatch which lies at anchor in the Hamble River which is certainly a most complete vessel. We then row’d up to Netley where we had a most elegant dinner, Sloane having sent his cook to prepare our repast, and in the cool of the evening we repair’d to the Abby which considering every circumstance of the trees, the emannance of the ivy, the beautiful state and the situation of the ruins please me more than any I ever saw. We drank tea in the abby and came home by land. I return’d to Broadlands that night. 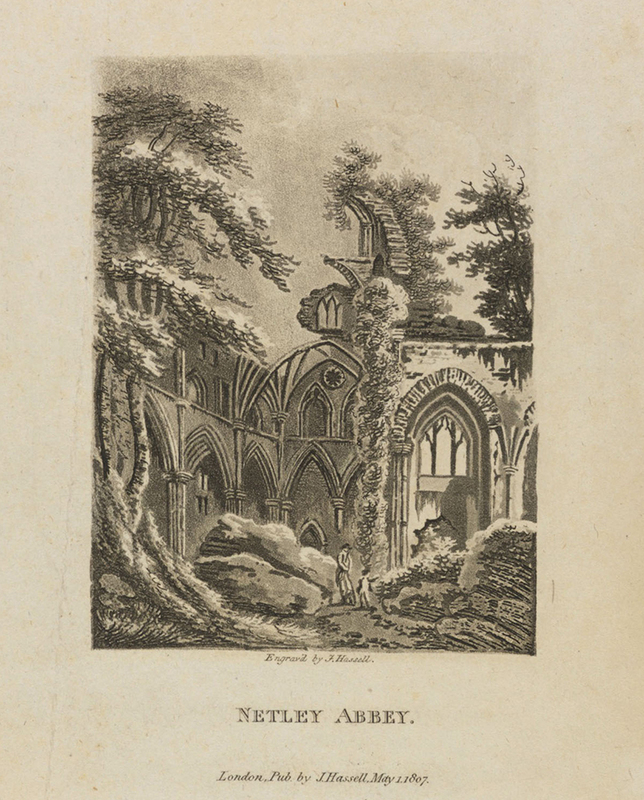 The Cope collection contains a range of material relating to Netley Abbey, including early guidebooks, poems, a novel, and even an opera. Evidence of its popularity can also be found in the wealth of visual material among the collection. Claps ominous her wings, foreboding death. Forlorn in melancholy greatness stand. And taught the unlettered world its maker’s praise! Once friendly marks to guide the wandering sail. A steadier beam meridian skies demand! ’Tis sense preserves the conquests Beauty made. 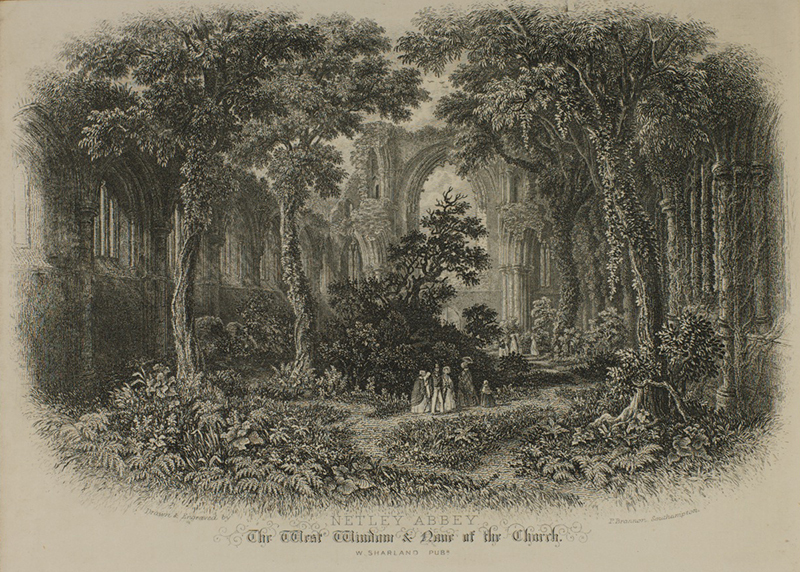 The second edition of the poem increased the number of stanzas from 26 to 50 and can be found reprinted with John Bullar’s Visit to Netley Abbey (discussed further below). Given the popularity of the site as a tourist destination, guidebooks inevitable followed. 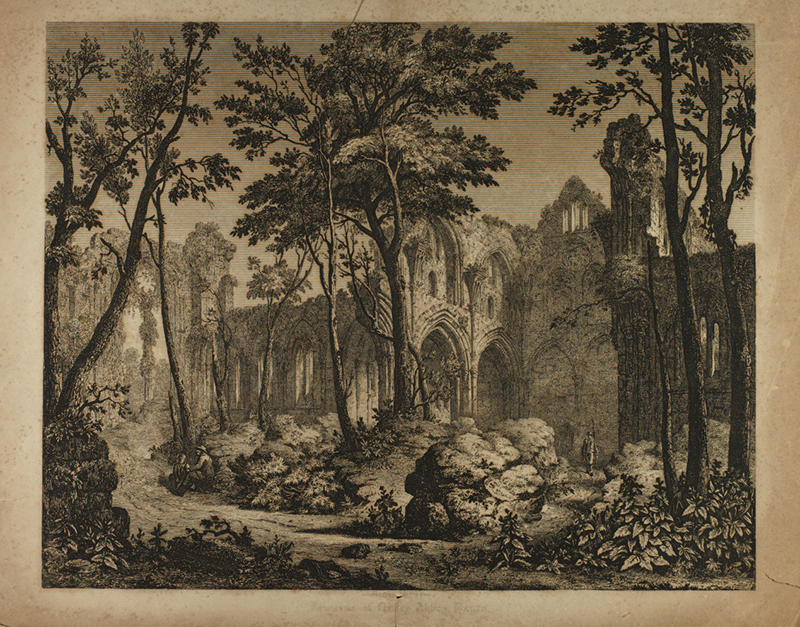 A prominent example is John Bullar’s A companion in a visit to Netley Abbey, first published in 1800. 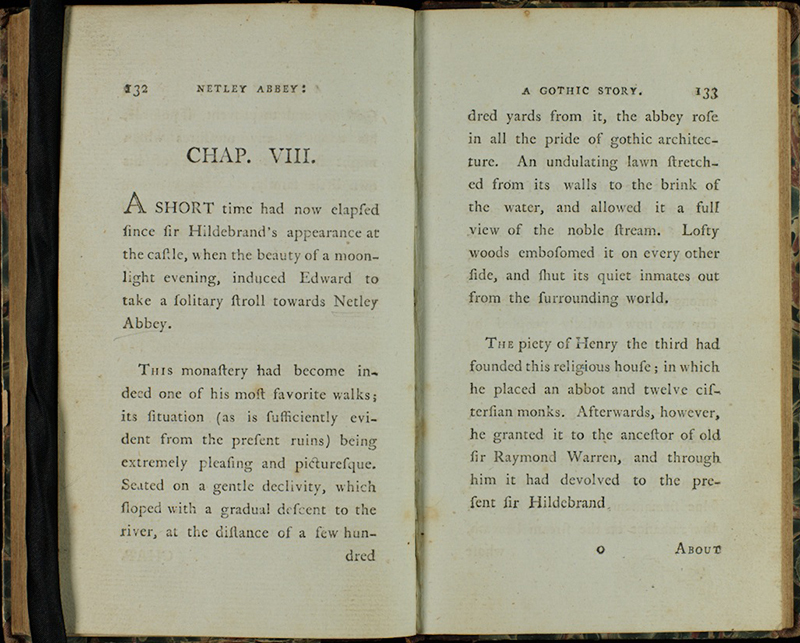 Keate’s elegy can be found annexed to the early editions of the guidebook, with an advertisement in the volume noting that: “When first Mr Keate published his elegy entitled Netley Abbey, he prefixed to it a short sketch of the history of the foundation. 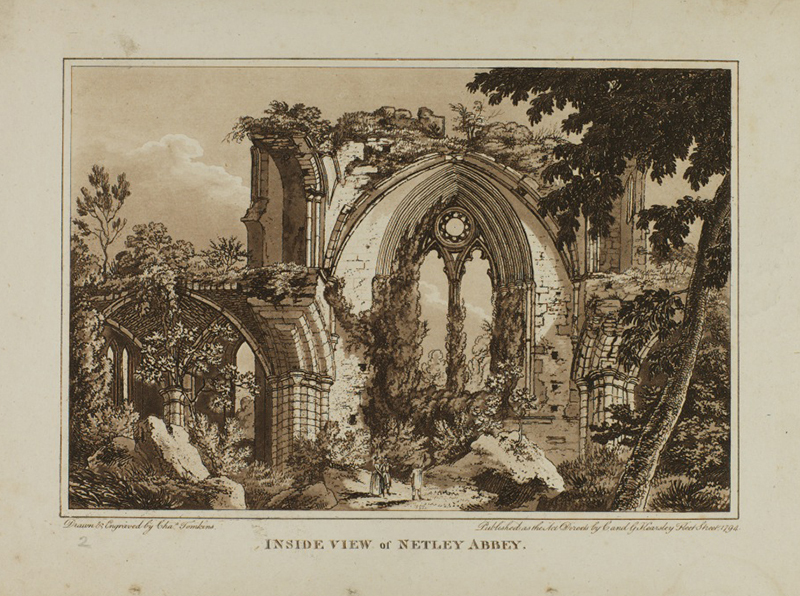 In the present publication, that account has been considerably enlarged; and such other additions have been made, as to render it a Guide to those who may visit these beautifully situated ruins.” [A companion in a visit to Netley Abbey, John Bullar (Rare Books Cope NET 26)]. Running into nine editions, the guidebook provides topographical details, along with a history of the abbey, a number of vignettes, and a ground plan of the site. Sublime in ruin!– grand in woe! No voice awakes thine echoes now! No sound — Good Gracious!– what was that? Why ‘zooks! it’s the popping of Ginger Beer! The 1889 edition in the Cope collection was published posthumously with the poem accompanied by lithographic illustrations by Enest M. Jessop. 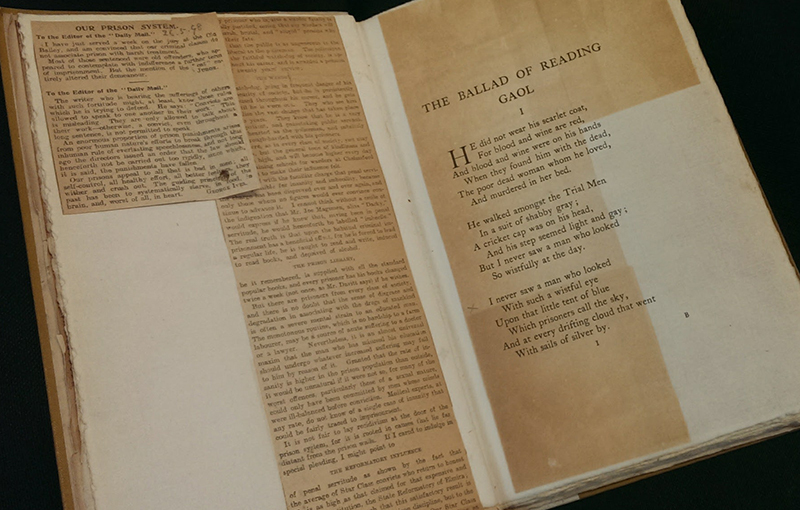 In this week’s blog post Jennifer Scott, a PhD candidate in the English Department, examines a unique copy of Oscar Wilde’s The Ballad of Reading Goal held in the Special Collections. There is something undeniably thrilling about handling an early or rare edition of a much-loved work of literature. An even greater thrill of working with Special Collections, however, sometimes comes from an unexpected discovery. 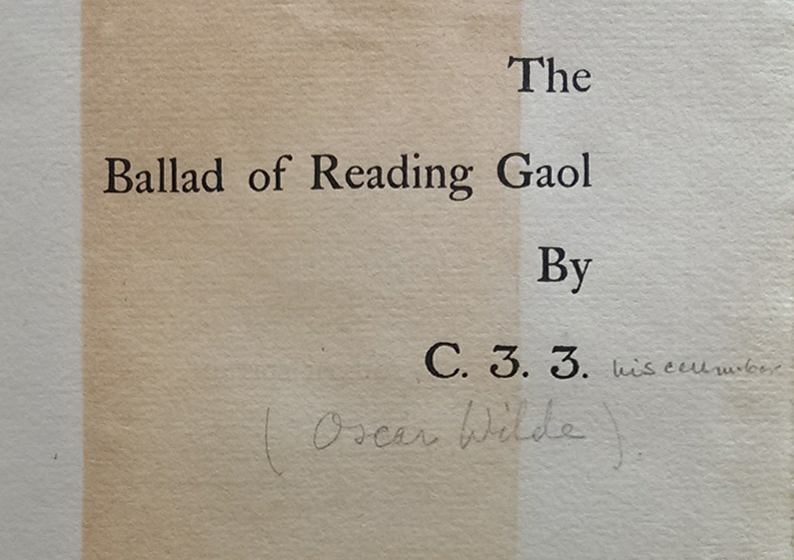 The Hartley Library’s copy of The Ballad of Reading Gaol by Oscar Wilde – a copy of the fourth edition of this work from 1898 – was, for me, one of those discoveries, holding between its covers a special collection of its very own. The book is inscribed ‘R. Bruce Boswell 1898’ and has been treated as a kind of scrapbook. Pasted throughout, on the blank verso sides of the pages alongside the text, as well as on the book’s inside covers, are numerous contemporary newspaper clippings, many of which have been marked and dated in the owner’s hand. The clippings concern Oscar Wilde himself, The Ballad of Reading Gaol, the impending publication of De Profundis in 1905, and debates surrounding penal reform. Boswell’s careful collation of these clippings, as well as his written comments, show a reader forming links between the reports of the press and Wilde’s own poetic description of his prison experience. Examining Boswell’s pencil markings, which range from ambiguous crosses and question marks to more revealing statements and questions, one gains a sense of a reader who was sceptical of Wilde’s account and of his views – a reader who even had the gall to correct some of Wilde’s most famous lines, changing ‘Each man kills the thing he loves’ to ‘Each man may kill the thing he loves’ and replacing ‘The brave man with a sword’ with ‘The bravo with a sword’! Yet, one may also discover a reader willing to thoroughly engage with Wilde’s text and open-minded enough to also highlight some consistencies between Wilde’s account and those reported in the papers. Remarkably, Boswell is not the only reader to have left their mark on this book either. A second reader, identifiable only as E.G.C., has responded to comments by Boswell, showing debates about penal reform, and Wilde’s place within it, to have transcended public spaces such as courtrooms and the House of Commons, and to have also occurred more privately. This book provides a unique glimpse of some of the ways in which ordinary readers responded to Wilde and his poem following his release from prison in 1897. Despite Wilde’s name being too cloaked in scandal to appear on the ballad until 1899, Boswell’s copy reveals just how open the secret of its authorship was. 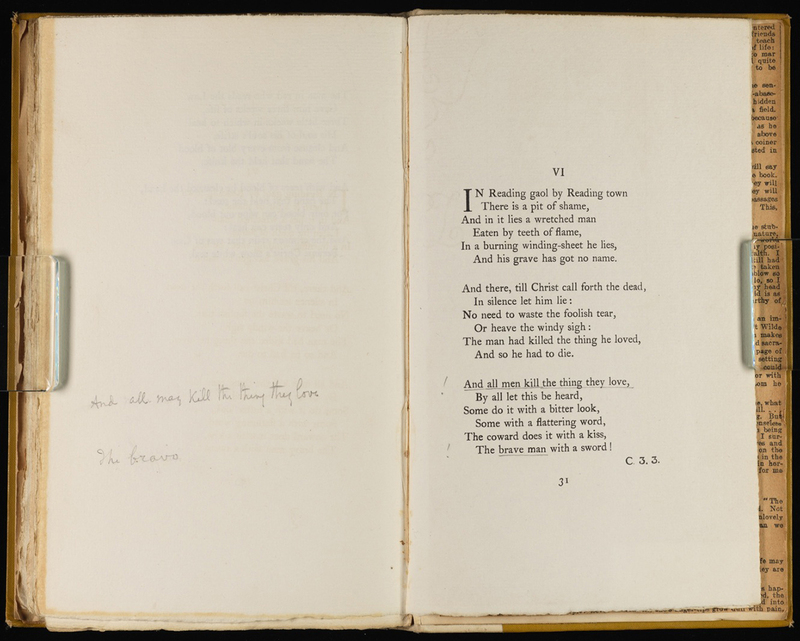 The first six editions of The Ballad of Reading Gaol bore only Wilde’s cell number, C.3.3. Furthermore, it reveals the human complexity of Wilde’s readership, which did not fall, as it is so easy to imagine, into black and white categories of supporters and detractors. The marginalia of R. Bruce Boswell and E.G.C. rather exhibit a developing engagement with this text that was influenced by both public and private debate. I first wrote about this book in my MA thesis in 2010. I am now studying for a PhD and recently revisited the book for a conference paper, which I delivered at the British Association for Victorian Studies (BAVS) Annual conference on 23 August 2017. Jane Austen’s association with Southampton is often overlooked — it does not provide as picturesque a backdrop to her life as Bath or Winchester, nor is it a setting for any of her novels. 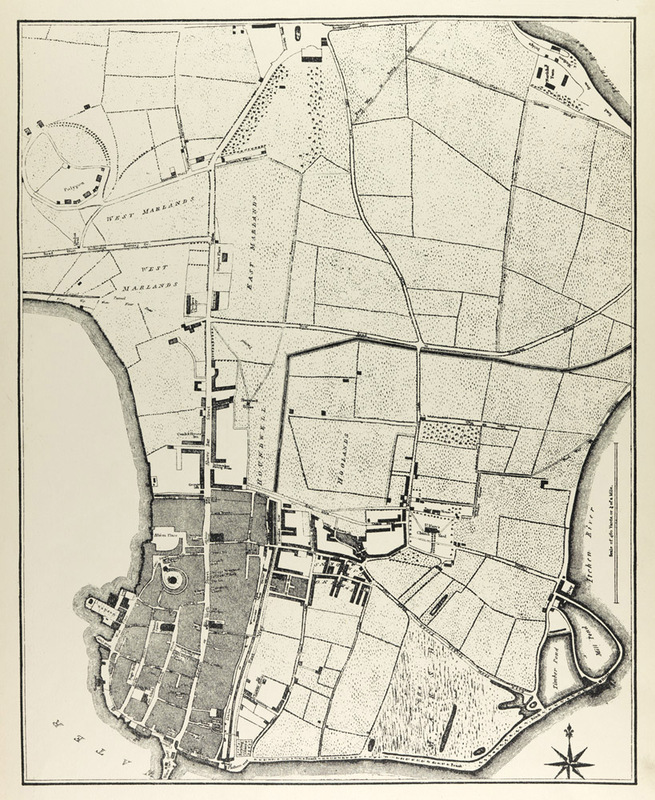 Nevertheless, Southampton was briefly her home as a schoolgirl and again from October 1806 until early 1809. 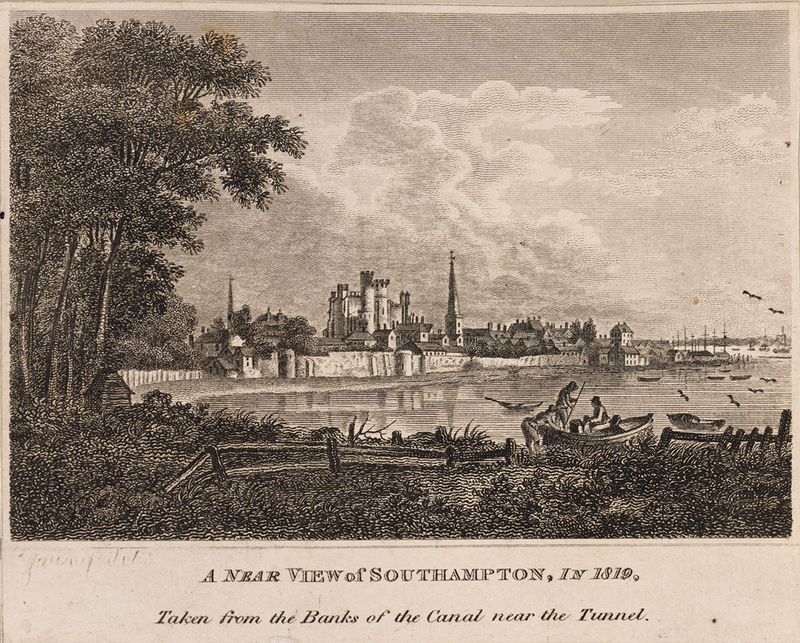 Although much of the town that she knew no longer exists, glimpses of it can be seen in many of the Cope Collection’s older prints and in contemporary publications such as The Southampton Guide (1806). It was after the death of Rev. George Austen, that Jane, her mother, her sister Cassandra, and friend Martha Lloyd, moved to Southampton to set up home with her brother Frank and his wife. At first they lived in lodgings, but in March 1807 moved to 2 Castle Square, a house rented by Frank from the Marquis of Lansdowne, the owner of the mock gothic castle nearby. Tobias Young ‘A near view of Southampton in 1819; taken from the banks of the canal near the tunnel’ (1819) in Cope, Sir W.H. 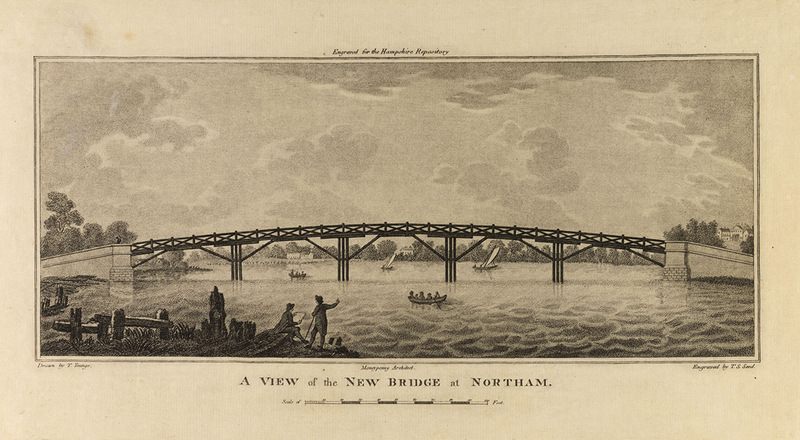 Views in Hampshire, v.4: illus. 116 [Rare Books Cope ff 91.5]. Castle Square is thought to be the large house with tall chimneys in front of the castle. Jane described preparations for the move in letters written to Cassandra, who was visiting their brother in Kent. She appeared especially pleased with the garden, in which the town wall formed a terrace overlooking the river. Her remark that “We hear that we are envied our House by many people and that the Garden is the best in the town” is confirmed in the contemporary guidebook by Sir Henry Englefield, who described the view from the gardens in Castle Square as “commanding an enchanting view of the bay, from the town to the village of Millbrook, and the river beyond it quite to Redbridge”. Something of the life led by the Austen family in Southampton can be seen in later letters to Cassandra. 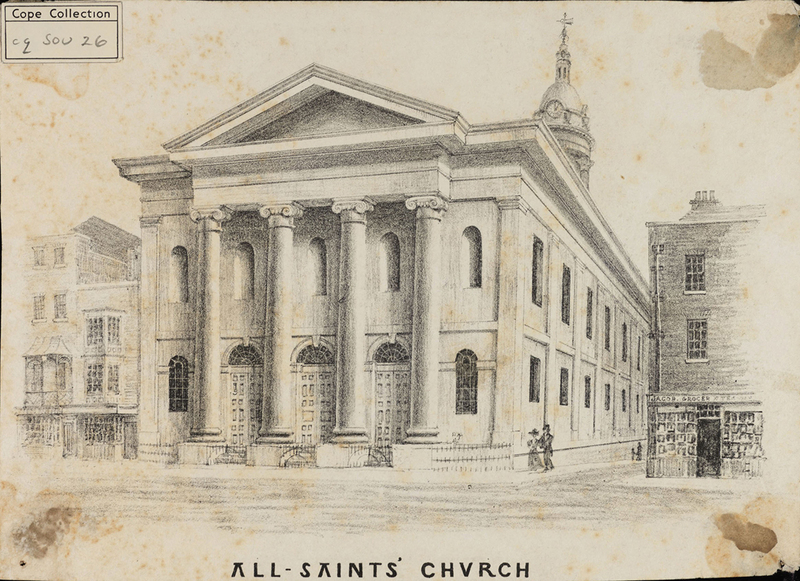 They attended All Saints Church, the comparatively new church at the corner of the High Street and East Street, visited the market near the Audit House and no doubt the pastry-cook Mr Webb, whose house was badly damaged by a fire which Jane Austen witnessed. Dealings with silk dyers were mentioned, spruce beer was brewed and books read each evening, much time was also spent receiving and paying calls. The streets of Southampton must have become very familiar to Jane Austen. A “regular walk” took in Bellevue, the large house towards the northern end of London Road and the Austens also enjoyed the pleasant walk through the suburb of Above Bar to the Polygon. A certain amount of stamina was needed to visit the Lances of Chessel House, Bitterne, which involved walking to the ferry to cross the Itchen, continuing to the house which was in the vicinity of Chessel Avenue and returning home via the new Northam Bridge. 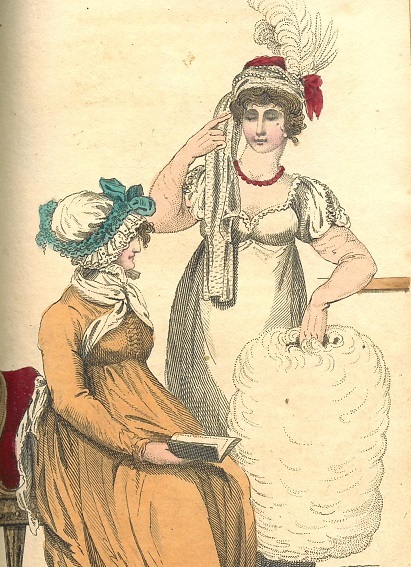 After such a walk in Dec 1808, Jane described herself and Martha Lloyd as “scarcely at all fatigued”. There were occasional visits to the theatre, apparently not well thought of – “Martha ought to see the inside of the Theatre once while she lives in Southampton & I think she will hardly wish to take a second view” and also to the Ball. 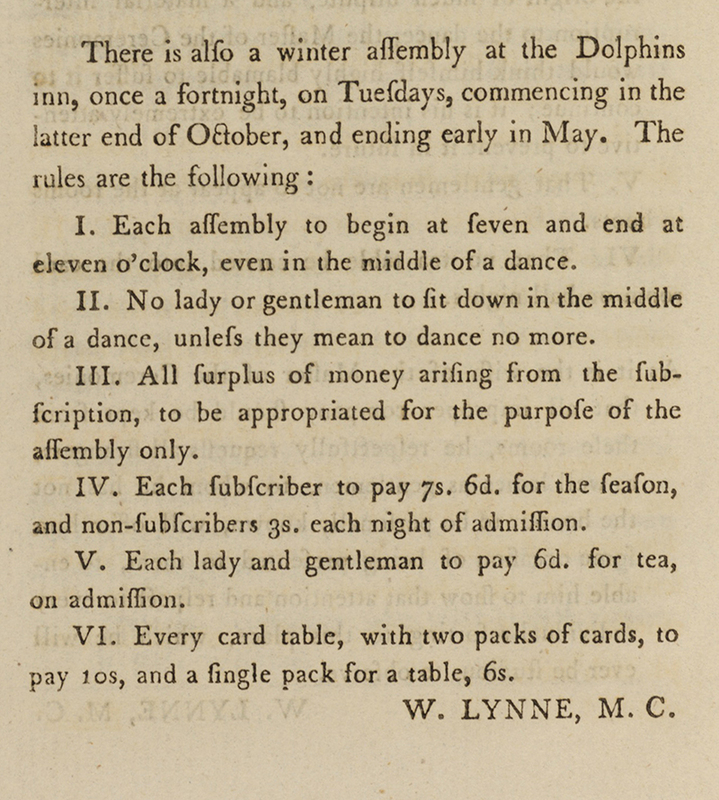 Only attendances at those held at the Dolphin during the winter months are recorded, Jane attending one in December 1808 and also the Queen’s Birthday Assembly Ball in January 1809. The Austens hosted a number of family visits during their years in Southampton. A visit in September 1807 by Edward Austen Knight, his wife Elizabeth and children William and Fanny was recorded by Fanny, then aged fourteen. On Sunday, after going to Church there was a walk to the Polygon, Monday included a visit to the theatre and Tuesday brought a boat trip to Hythe. On Wednesday everyone except Mrs Austen senior took a boat to Netley Abbey and according to Fanny, they ate some biscuits which they had taken, and returned quite delighted. Later the same day she and her Aunt Jane walked in the High Street till late. On the final day, all except Aunt Jane went on a drive through the New Forest to Lyndhurst and Lymington. Jane Austen’s letters record little of her views on Southampton itself, but some of the residents did not escape her judgement. Of Mrs Lance of Chessel House she wrote, “they live in a handsome style and are rich, and she seemed to like to be rich”, of a Mrs Bertie, “Mrs Bertie lives in the Polygon, & was out when we returned her visit – which are her two virtues” and of the Marchioness of Lansdowne and Mr Husket, the painter employed by the Marquis, “I suppose when the Walls want no touching up, he is employed about My Lady’s face”. In recent years, Jane Austen has been reclaimed as a famous former resident of Southampton, there is now a Jane Austen Heritage Trail and her remark on the “stinking fish of Southampton” has not only been forgiven but also adopted as the name of the festival with which the City is marking the 200th anniversary of her death. To mark International Children’s Book Day which is celebrated on Hans Christian Andersen’s birthday on April 2nd, we take a look at some of the children’s books in Special Collections. Although children’s literature is not a focus of the collections at Southampton, examples of children’s books, both educational and recreational can be found amongst the Rare Books. 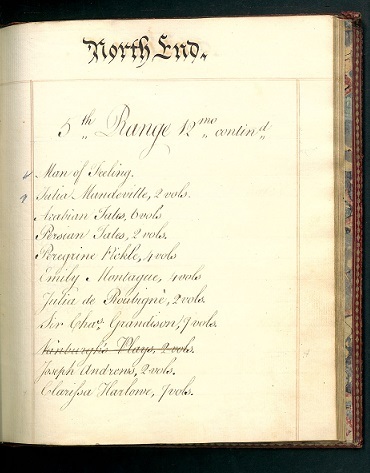 There are schoolbooks belonging to Henry Robinson Hartley, to whom the University owes its existence, books of instruction in farm life in the Perkins Agricultural Library and in the Salisbury Collection, examples of ‘botanical dialogues’, which take the form of a series of questions and answers. In Maria Edgeworth’s Dialogues on Botany for the Use of Young Persons (London, 1819) the children, Fanny, Emma and Cecil “were so much interested in the structure and growth of vegetables that they seldom let a day pass without soliciting some instruction from their Aunt”. 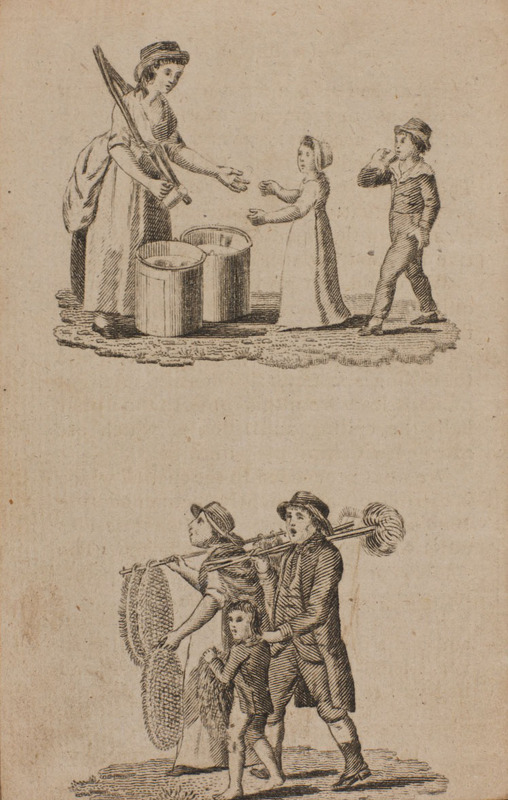 There are also books on history and geography, and in Letters Written from London (London, 1807) the young visitor’s description of the street traders, their wares and their cries gives an insight into daily life in the capital. As well as the educational books, there are also examples of the picture books or ‘toy books’ printed by Edmund Evans (1826-1905), the leading woodblock colour printer in London. 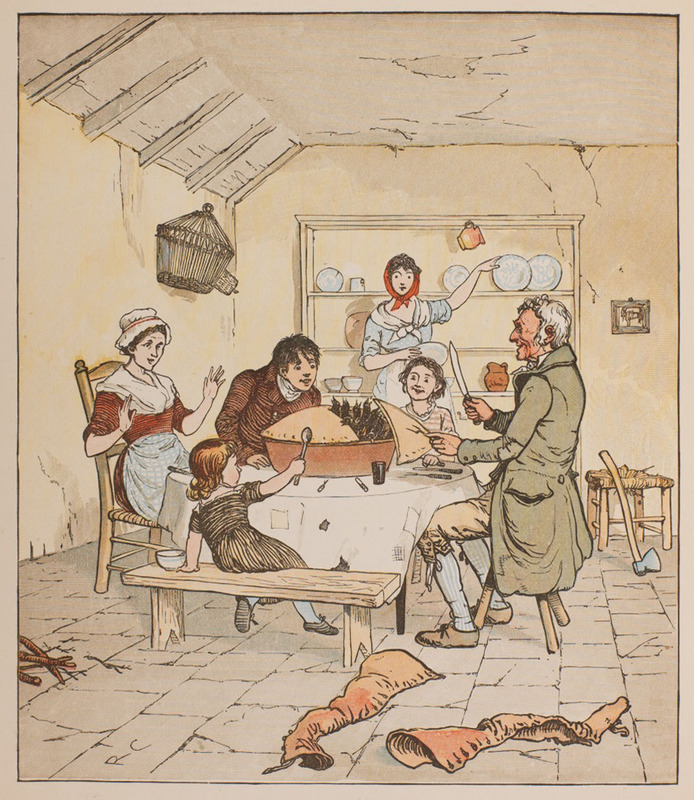 Although early nineteenth-century children’s books often included illustrations, these were usually black and white engravings or woodblock prints, and if coloured, the quality was generally poor. 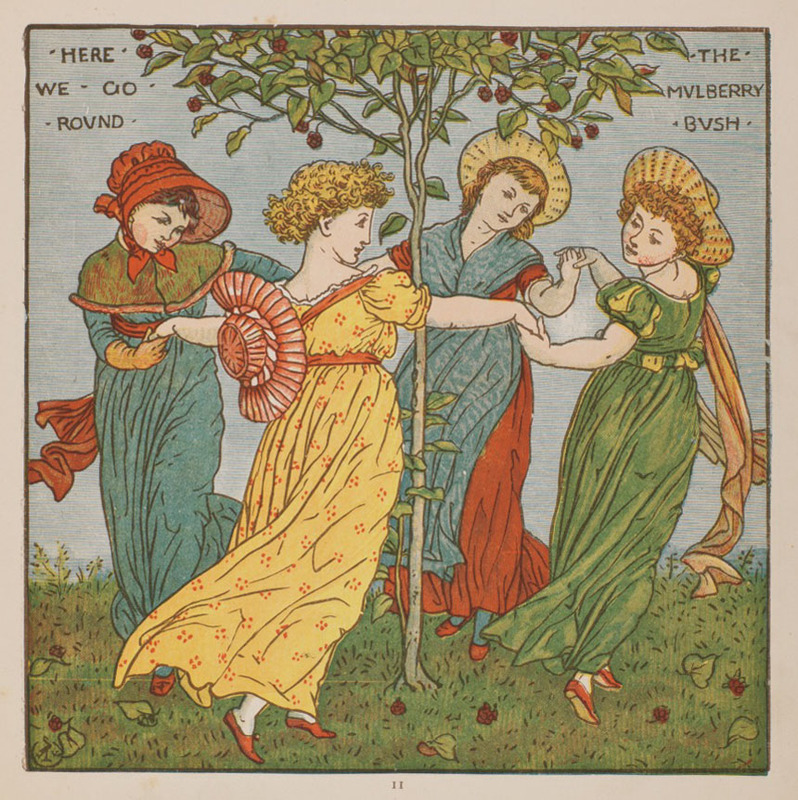 Colourful picture books, recognisable to children of today, appeared only after the mechanization of printing and advances in colour printing techniques. These changes, coinciding with a growing market for well-produced children’s books amongst the middle and upper classes meant that picture books became a profitable line for many publishers. Evans had perfected the technique of reproducing the colours of original illustrations by using as many as sixteen woodblocks and eight to twelve colours for a single illustration. In his toy books fewer blocks and colours were used, but the results were a vast improvement on existing coloured illustrations. Having printed a series of toy books for Routledge in the mid-1860s, Evans went on to set up his own business, commissioning illustrations from Walter Crane (1845-1915), Randolph Caldecott (1846-1886) and Kate Greenaway (1846-1901), now regarded as amongst the greatest children’s illustrators of the Victorian period. Crane’s The Baby’s Opera (1877) was something of a deluxe toy book. 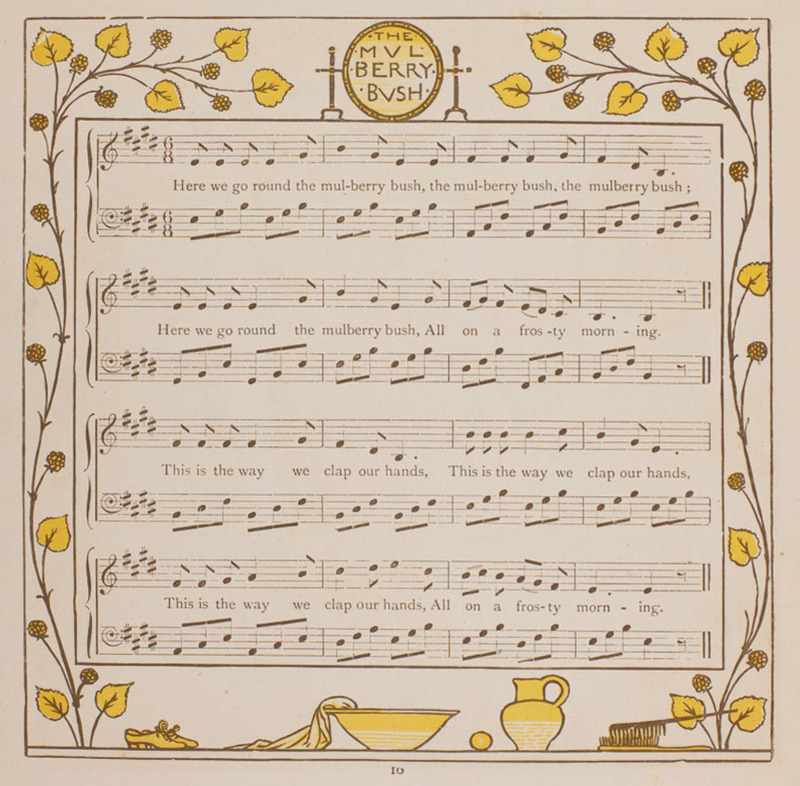 It included the music as well as the words of nursery songs and demonstrated Crane’s approach to book illustration as a decorative art, encompassing the book as a whole, rather than focussing individual illustrations. A member of the Arts and Crafts Movement, he was influenced by his study of Japanese colour prints, emulating their sharp outlines and flat or very deep perspective in his own work. Randolph Caldecott had already contributed illustrations to a range of publications, including Punch and the Illustrated London News before he was engaged by Evans in 1878 to illustrate two picture books each Christmas, an arrangement which continued until his early death in 1886. 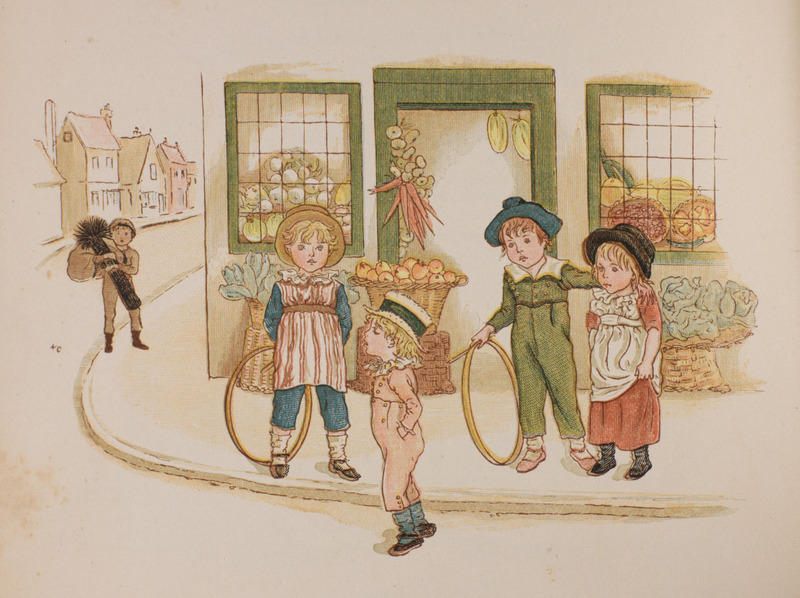 The books featured nursery rhymes or fairy tales and in Sing a Song for Sixpence (1880) Caldecott’s detailed yet vigorous drawings, show the appeal of his work to children. Caldecott also illustrated a number Juliana Horatia Ewing’s books for Evans, these being published by the Society for Promoting Christian Knowledge. In 1879 Evans engraved and printed Kate Greenaway‘s collection of poetry and drawings Under the Window, after which she rarely entrusted her work to anyone else. In Little Ann and Other Poems (1883) Greenaway illustrated the poems of the early nineteenth-century poet Jane Taylor, the children being dressed in her characteristic interpretation of the fashions of the early nineteenth century. Such was her popularity that Liberty’s of London introduced a line of children’s clothes, based on her drawings. The picture books in Special Collections have come from a variety of sources, some having been donated and others having been part of the Library of La Sainte Union College of Education. As well as the original nineteenth-century publications, there are modern facsimiles of early children’s books in a selection of titles acquired for the School of Education from the Osborne Collection of Early Children’s Books at Toronto Public Library. More recent publications of classic children’s books can be found in the Children’s Fiction Collection on the open shelves of the Hartley Library. This week’s blog post looks at two literary figures who are the subject of a recently catalogued collection in Special Collections. Pamela Frankau was born on 3 January 1908. She was the younger of two daughters of the novelist Gilbert Frankau (1884-1952) and his first wife Dorothea Frances Drummond Black. After Gilbert left the family in 1919, Pamela and her sister, Ursula, were sent as boarders to Burgess Hill School for Girls in Sussex. While initially keen to pursue the stage, her gift for writing soon took over. Pamela’s paternal grandmother, Julia Frankau (1859-1916), was also a successful novelist, writing under the name ‘Frank Danby’. According to Pamela’s cousin Diana Raymond, it was through her grandmother that she inherited a strong Jewish literary inheritance. Pamela published her first novel, Marriage of Harlequin (1927), at the age of nineteen at which time she was recognised as the “talented daughter of a famous father”. Over the years, however, her success would match that of her father and by the time she was thirty she had already written twenty novels. In 1931 she met the poet Humbert Wolfe, with whom she had a long term relationship which lasted until his death in 1940. In the years following Wolfe’s death she spent much of her time in the States and didn’t publish another novel for almost a decade. It was during this time that she converted to Roman Catholicism. She married Marshall Dill (1916–2000), an American naval intelligence officer, in 1945 but the marriage foundered, and ended in divorce in 1951. She also had a number of intimate relationships with women throughout her life, including theatre director Margaret Webster, which began in the mid-1950s. 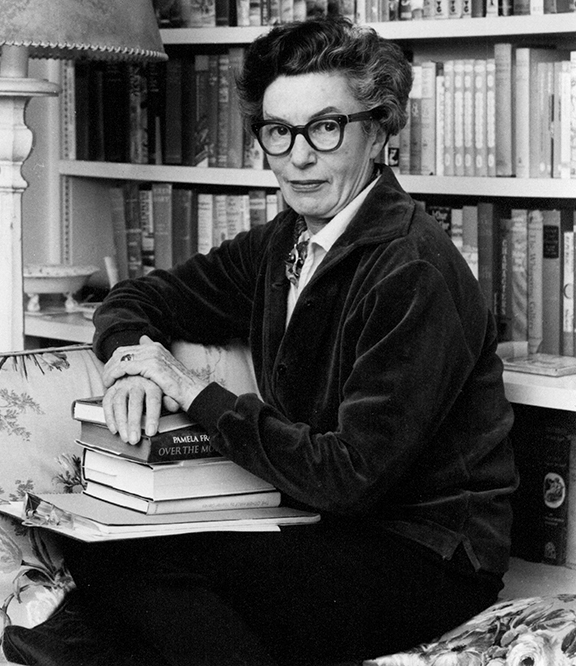 In 1949, she published her most successful novel, The Willow Cabin, which was partially based on her relationship with Wolfe. While many of her novels received high acclaim during her lifetime, A Wreath for the Enemy, first published in 1954, remains arguably her most enduring work. It tells the story of a young couple whose paths cross one summer on the French Riviera. However, Diana Raymond notes that Pamela’s favourite of her own works was The Bridge, published in 1957, which examines the imperatives of the Roman Catholic faith. After a long struggle with cancer, Pamela Frankau died on 8 June 1967, at the age of fifty-nine. Diana Raymond was Pamela’s cousin and the two women had a strong personal relationship. Born on 25 April 1916, Diana started writing at the age of sixteen. While her first novel, ‘The Lovely Travellers’, was turned down by publishers, Pamela encouraged her to continue writing. Her second novel, The Door Stood Open, was published when she was nineteen. During her long career, she wrote more than twenty novels, as well as an autobiography and the play John Keats Lived Here. In 1940 she married the novelist Ernest Raymond. While initially overshowed by his reputation, over time she developed her own distinct voice with her obituary in the Independent describing her novels as being “infused with wit and metaphysics”. Her novels include Are You Travelling Alone, a political novel published in 1969; The Dark Journey, a haunting romance published in 1978; and her most popular novel, Lily’s Daughter, a social satire published in 1988. The latter novel tells the story of a young woman’s coming of age in 1930s England and contains many biographical elements. After Pamela’s death in 1967, Diana completed and provided an introduction to her final novel Colonel Blessington, a thriller, published in 1968. Diana also provided the introduction for a reissue of Pamela’s novel The Winged Horse and, in 1988, was commissioned to write a biography titled ‘Pamela Frankau: A Life’. However, as her research progressed Pamela’s popularity was on the wane and the project was eventually abandoned. 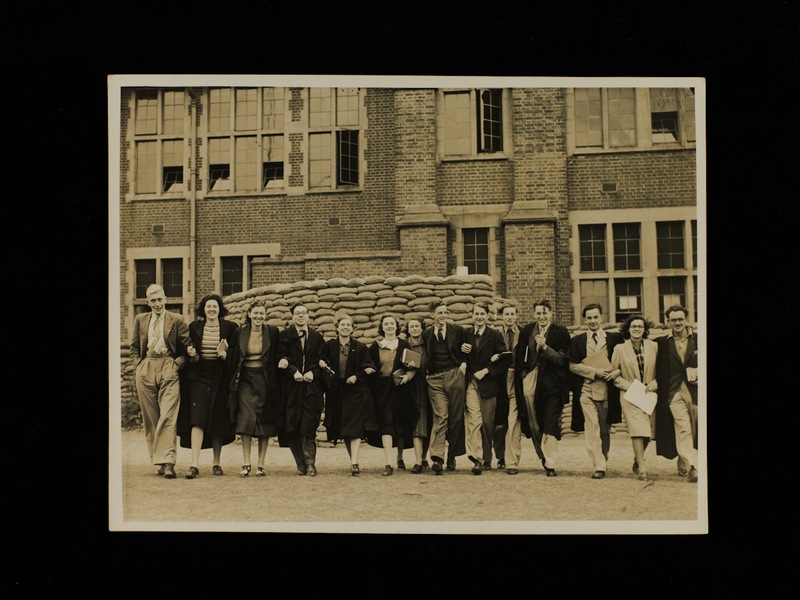 The material in MS 412 primarily relates to Diana Raymond’s research for her biography of Pamela Frankau. In addition to research notes, the collection contains a range of correspondence. This includes correspondence between Diana and Timothy D’Arch Smith, the son of Pamela’s older sister Ursula. Timothy is a bibliographer, author and antiquarian bookseller. 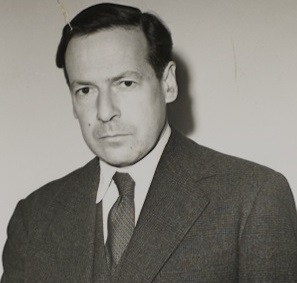 After her death, he became Pamela’s literary executor and was a strong supporter of Diana’s research. There is also a selection of earlier correspondence between Pamela, Diana and others, primarily concerning the publication of Pamela’s novels. The collection also contains a number of works by Pamela Frankau. These include scripts for Ask Me No More, The Duchess and the Smugs, Time to be Going and To The Moment of Triumph. Stories include ‘The Giant-Killer’, ‘Shakes the Stars’, and ‘Marriage of Minds’, alongside a number of pieces written by Pamela’s sister Ursula, including ‘The Clausewitz Report’, an unfinished novel. Other collections relating to Pamela Frankau can be found at the BBC Written Archives Centre, Boston College, and the Harry Ransom Center at The University of Texas at Austin.